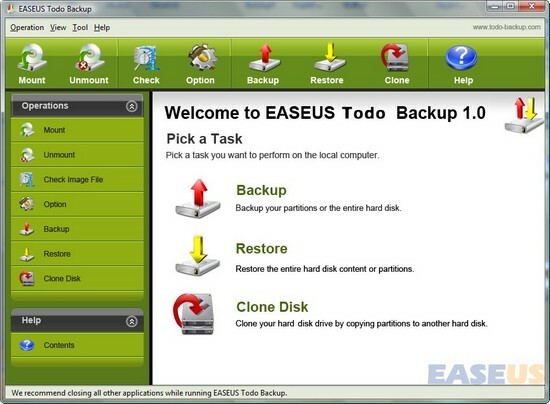 EASEUS Todo Backup is an award-winning and Free backup and restore solution for a good reason: with detailed instruction wizards, your computer will be in a safe condition within minutes without the help of an IT specialist to backup your system state, partition and disk. EASEUS Todo Backup can backup your system partition to quickly get the system up and running in the event of a system crash or hardware failure. It allows you to backup and restore disk or partition after viruses attack, unstable software download, hard drive failure, etc. All in all, EASEUS Todo Backup will prove to be very useful when you need to upgrade various older or smaller hard disks without having to reinstall the OS and all the programs all over again. · Backup system: backup the entire system partition, including the system state and all files to an image file. · Backup disk: backup the whole disk including operating system, all data to an image file. · Restore image: restore all the previous backed up disk and system image in a few minutes. · Bootable CD/DVD: restore system and disk with bootable CD/DVD when there is a boot failure. · Clone disk：clone disk to backup or upgrade to a newer or larger one without reinstalling operating system. · Check image file to ensure successful restoration.